Real reviews from our customers. I never contact companies about feedback, good or bad. Ever. I have about 5 years worth of digital video stored on an external USB 1TB drive, and just got back from the most amazing father-daughter flying trip in our little plane through the Bahamas that will never be equaled again. Long story short - I edited an insanely awesome youtube video of the experience for posterity, and the video software locked everything up, something went horribly wrong, and the external drive was unreadable, and windows kept insisting on FORMATTING the drive. I was lost. My families vacations, trips, life, video - was gone. No backup of a 1TB drive either - too big (fixing that now). In desperation I got your software, and after 3 days of trying different settings and doing extensive disk searches (it found all "lost" files instantly, but I needed the file names to save 2 days of video editing work) it recovered everything, AND the file names. Absolutely AMAZING. You saved my family history! You guys are GENIUSES and MAGICIANS. Thank you thank you thank you!!! See Aaron's recovered video below. I just had to drop you a note to let you know how THRILLED I am with the performance of RecoverMyFiles software. I had a major system crash but was (initially) able to back up my documents, pictures, music, etc. to an external drive. When I reinstalled Windows Vista, it (for reasons I'll never understand) copied the contents of the C drive to the external drive, and overwrote EVERYTHING that had been backed up on that external drive. Another software (that was rated #1 in a 2011 "data recovery software" review!) was a total waste of time and money - it didn't find even ONE single file I had lost. But RecoverMyData performed BRILLIANTLY! First - the free download & search let me know if it was going to work for me BEFORE I had to lay out my money. Second - it did multiple scans of the external drive, finding EVERYTHING I had lost. I couldn't buy your software fast enough! And third - every file it recovered has been exactly what I lost, fully functional and complete! I know I was lucky that the recovery was from a "virgin" hard drive (before Vista wiped out my backup, those files were the first thing ever written to that drive), but you cannot know how a) upset I was when Vista deleted my backups; and b) how TOTALLY EXCITED I was when your software found everything I had lost! My Hats Off to your development team!! And a rousing round-of-applause for everyone there. I hope this message lets everyone at GetData know ow much I appreciate the work they put into developing and supporting this software. It worked - it worked right - it worked the first time. My most sincere THANKS!! I could write a glowing review of this recovery software that I purchased. I recently returned from a New England trip in the Fall and I came back with over 1,800 photos. It just so happened that they all got deleted off my computer when I had to return my computer to it's original factory condition and it was ONLY with your software that I was able to recover 99% of my photos. It was a very special trip for me and these photos were extremely important to me. Your software allowed me to hold on to those memories and I am so grateful that I found it. It's just great. Feel free to pass this feedback along to anyone who should see it or to anyone who would be interested in it. 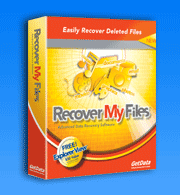 As you know, I have just purchased my copy of Recover My Files. It has been recommended to me by a friend who is a computer technician. I have lost a partition as I am not very smart in all that computer stuff and I too often act before thinking in the computer stuff. Your software has recovered all my files in the sector mode search on an unreadable dynamic volume -as described by windows, which had two partitions with important data throughout the years. I have made a hasty movement and in a windows XP instalator I saw an unpartitioned 20GB space and a dynamic volume. I made a partition of that 20GB, but it was added to the dynamic volume, and in windows other two partitions discontinued to be visible on the only computer that has seen them so far !! My legs got soft. And here you guys came to recover all my critical data ;-) Your software is definitely worth every single penny I paid for it !! I will be trueheartedly recommend your software to everyone and I will also take a look at your other software. I have to thank you for this program. I tried a couple different programs and this was the best I found. I recently cleaned up my wife's pc and lost about 6 months of pictures of my 2 1/2 year son. But thanks to your program I was able to recover most if not all of them. Thank you very much and keep up the good work. I am a freelance Graphic Designer and Web Developer. I was using a Western Digital External fire-wire HD, to store all of my Adobe Illustrator, Photoshop, Fireworks, Flash, Dream-weaver, as well as all of our business documents, ie Word, Excel, Access, etc. On Friday, I lost the entire drive, and all of the contents. I am talking about over 130 Gb of information. I could not sleep and worked on the drive for over 34 hours. I downloaded your product on Saturday, and it absolutely 100% recovered all of the data from the hard drive. The MBR was corrupt, and I even formatted the drive, but your program still found 100% of the data, I assumed our business would have otherwise lost. At one point, I was going to take the drive to a data recovery specialist, but your program, literally saved my partner and I from suffering a loss of our invaluable data and personal files. I just wanted to thank you for the great job that Recover My Files did with salvaging my lost data. Our system crashed on Tuesday and we lost only a couple of days work rather then years. Unfortunately our backup system had failed some time ago so it was useless. I am having radiation treatments and was trying to give myself a little treat and some distraction by upgrading my comp, but I didn't understand the wording when the raid controller software asked how I wanted to set my array - so I lost everything I was trying to protect with the raid - irreplaceable things like family photos which really mean a lot to me right now. I just installed a new raid 3 gb enabled mobo and misunderstood what the raid setup was asking - so I overwrote 250 gb of files! Utter desperation set in once the outright panic was done, so I googled and saw your product - and tried it.. UNREAL! I have every file back thanks to you all. Your software got it ALL back for me - Thank you! Don't tell your sales department, but $70 USD was a bargain for this - Thank You So Much! Thank you. In about 10 minutes I recovered recent drafts of my daughter's Master's dissertation from a totally crashed USB flash pen. Other recovery software failed. We are most grateful. just purchased and used this programme. it rocks and, has returned to me my entire private file directory. well done boys and girls! I purchased Recover My Files on 10/12/06. This was after my computer crashed and started smoking this HP desktop computer was less than one year old. I did not think to backup my pictures, tax files, and important data (I know better now). Well the system formatted the hard drive by itself and started working again. Needless to say, all of my family pictures vacations, daughters’ prom, pageant etc.. was gone. Hp wanted me to send in my computer for service but, I knew that if I send them the computer with the hard drive they might not return it or re-format the drive with all of my important information on it. So I pleaded and negotiated with them to let me remove my hard drive and then send in my computer for service. Well I couldn't be happier when most of my pictures were recovered. Most services charge you $500.00 plus to recover your files. This was the best and most rewarding $ 69.99 I spent in a long time. Thank you for your great software. I am telling everyone I know about your software. Feedback: Well, it worked.!! I recovered 15 GB of uncorrupted files from that corrupted external hard drive. In fact, FYI, I was even able to recover data on my desktop hard drive which had just recently been reformatted with the OS reinstalled. Amazing. I thought the drive was completely "erased," but the program found stuff anyway. What a relief! I send you my many thanks for an incredible program. Also, I really appreciate the features of the newest version, which allows for actually previewing the recovered files/photos before transferring them. With any luck, I can avoid needing to use the program in the future. Again, your program and support are absolutely terrific. THANKS! PS : feel free to use these comments on your site for "customer feedback," if you feel the need. 1 of 25 tested that actually worked. My hard drive became unreadable after performing a disk defrag that hung in the middle. After I rebooted the computer, the drive was no longer readable by my Windows XP SP2 software. This drive contained a couple months of unbacked up photos, including pictures of my new daughter. After two weeks of trying various methods and over two dozen programs, I finally had a break thru with Recover My Files. Trust me, there are hundreds of recovery software out there, but finding one that works and doesn't hurt your data was very difficult. Additionally, it was very disheartening to try so much software without any results. I truly was starting to think that my pictures were gone. The difference in this software vs. others is that you define the type of file you are looking for (i.e. digital camera .JPG) and it scours the hard drive at the sector level looking for that type of file. I was able to recover ALL my pictures with this software. Most other recovery software looks to recover some type of directory structure. As I came to learn, my hard drive directory structure was destroyed (MFT - Master File Table) on my NTFS partition. Replacing or repairing the MBR, boot sector, or the partition definition was not enough. As I've come to learn also, there is no software available to repair an MFT. Most of software works to repair the other structures (MBR, boot sector, and partition definition) and most software out there assumes a working MFT because it is so hard to corrupt. My MFT became corrupt because of the disk defrag. I am forever grateful that this program was able to recover my pictures and am happy for you to add this to your data recovery software reviews page. Thank You, Thank You, Thank You! I have been storing mostly excel and word files, along with a few other formats, on a zip disk (250). The files cover ten years of work compiled from various hard drives and former floppies. Suddenly I could no longer read the disk. The zip was reading other disks fine, but this most crucial one would just sit there. I tried a few DOS copy tricks to no avail. Then I found this program, Recover My Files, and after reading the only review decided to give it a try. Man am I impressed! The program not only found all my files and allowed me to copy them to the hard drive. One company wanted $450 to recover my files. This program is a deal! It is easy to install and easy to use. Thanks Get Data for saving my life! Thank you so much. Your service is excellent. I only wish more companies had great customer service like you all do. Thanks again. After a virus attack (that got through Norton) I took my PC to a pro (?) for repair. He backed up my hard drive (NTFS) to a FAT32 and completely buggered up all the data. He couldn't recover anything. I took the drive he'd used back home, plugged it in to the slave socket, and ran the paid for version of Recover My Files. Bingo; one pass and ALL the data files were back and usable. It doesn't pull back system files and the like, but that's not important. Simple, quick, cheapish and works. "Forget the rest, if your in trouble, this is it!" Tried several other products that promised results, one didn't find anything, the other just a smattering of files. This program, though a little unintuitive did the job. I had mistakenly installed XP pro over the partition where 15 years of files - Kids wavs, pics, excel, word docs, text files...I wasn't watching. It did a format, then installed over all my stuff. This program brought back (in great condition) 98% of all of it. UNBELEIVEABLE. WORTH IT!!! every penny of the $69.95 American. I needed a program to recover accidentally deleted JPEG files from a digital camera compact flash memory card. It found them easily, in addition to numerous intentionally-deleted others dating to as many as 9 months ago. I easily selected the files I wanted to recover and it immediately saved them to the folder of my choosing. Perfect for my needs. Also features an easy-to-follow on screen guide, that can be kept open adjacent to the program window. Purchase and registration was easy, requiring only a few clicks after I determined that it was able to identify my lost files. Recommended even in light of the comparatively higher cost. Had explored a number of data recovery programs due to losing a large number of files from a formatted drive. Installed RMF on the master drive and made the second drive a slave, ran RMF, and it successfully recovered close to 6000 files! Pictures came out just fine as well as Excel, Access, PDF, and others. Highly recommend this product. I've tried quite a few on the same drive to no avail. This is it! I just wanted to thank you for the great Recover My Files program and saving my life. A few months ago, through an error on my part, I deleted my removable drive's content which included over 1000 family pictures I had taken (and other files). Frustrated and "broke" I had given up on getting any pictures back. My wife was not a happy at me to say the least! A friend of mine suggested using Recover My Files and two other alternate recovery programs. Since all were trial copies, I figured I would give them a try since they were not costing me anything. I tried the others (listed 1st in the directory) and nothing, then Recover My Files did the job! I could see the pictures that could be restored. I immediately paid my registration on-line and went to work. The program was easy, recovered more than just my pictures (e-mails, quicken, etc.) and did an exceptional job. I just wished I had found it prior to trying four other programs and paying for nothing! Thank you for a well designed program that delivers as promised. Recover My Files has already saved my bacon in several situations, and the most surprising was that it recovered some files that I had accidentally deleted on a digital voice recorder! Every time I've used it, I have been pleasantly surprised. That is not the case with most of the software that I've purchased and I'm not that easy to please. I can't tell you how many other programs I've tried off of download.com over the past 24 hours. Almost ready to scream and give up all hope. I found Recover My Files on a Google search. I was able to recover what appears to be all of the documents I was looking for on a system that had been reformatted and the OS reinstalled. Your product was much easier to use then the others and sure got the job done." I would just like to say that I am truly amazed by this software. I just cannot believe its power of revitalization. Of all the negative things you must get I would like to say that the amount of work that must have been put into recovermyfiles would likely blow most people away. Thank You. The virtual partitioning is unbelievable and not having the drive affected in anyway from working with computer detectives, truly amazing. After a overnight 10h scan on a 250GB I was right back in business before my personal disaster. Hours of DV-AVI files, excel word, jpg, bmp everything was recovered after an accidental format. I will always recommend your software to anyone how should come across a data loss situation. Your price is great I wish your company all the best success for years to come. I hope you guys are making tonnes of money from this cause you truly deserve it. Feel free to use my comments or edit them for whatever you like if you have customer testimonials etc, I'm just so Happy at how powerful this software is. A text typed thank you does not do my gratefulness any justice. I think I'll throw in an old Johnny Cash Record and tap my toes for awhile. I was working on my neighbours PC and I thought I had lost all there pics, business docs etc... Saved some footage of my son as an infant. Thank you so much. Just wanted to send you a quick note to let you know how much I appreciate your program! My son had accidentally deleted over 150 pictures from my SD card on my digital camera. I was so distraught and had no idea a program such as yours existed until I did a Google search as a "last ditch effort" searching for help. Your website came up and I really appreciate the opportunity to download and try it first prior to purchasing. Also, the cost of the program is not only reasonable but well worth the price to retrieve all of those irreplaceable pictures. Thanks again for saving the day!! I just had to take this time to thank you for your lifesaving program Recover My Files. Last night (12/7/06), I backed up my laptop so that I could reinstall Windows. When the computer restarted I forgot to unplug my USB back up drive so when the Windows installation began, I came to the partition screen and without thinking deleted my USB drive by accident! I was worried that I would have to pay over $300 to take it in and fix it. I went online and searched "recover" programs, installed and tested about 3 and none of them worked. I then went back and found your product. I downloaded the trial version to see if it would even find my USB drive since the other 3 programs didn't help. As soon as I downloaded Recover my files, and started the program, within SECONDS, not minutes, but seconds, it found ALL, yes ALL my files. I then paid for the program and was able to recover EVERY SINGLE FILE I thought I had lost! I must say your program was VERY easy to use. This was the first time that something like this had happened to me, and I was worried that I would have to pay $300 plus to get my information back. I searched those other companies and they all wanted at least $300. Then I would have to mail in my drive, wait a few days maybe even a few weeks before I would know anything. Your program let me know in seconds, yes SECONDS! I cannot express my gratitude enough because I was ready to take my hard drive to one of those companies because I had family photos, files, music, etc that was not replaceable. So again, thank you! Please feel free to use this as a more than satisfied customer feedback! If you have any questions, or I can be of any assistance, please feel free to contact me. Thank you again! I just wanted to let you know that using this tool, I was able to recover, very easily, about 580 images off of a SD card for a nice older lady. I had tried EnCase, FTK and SMART to locate the images. EnCase found them, using an EnScript, but was not up to easily recovering them. (I was having to copy/paste them by hand.) FTK and SMART didn't even see the images. Your product found them, recovered them and saved them in two easy steps. Thanks for a great tool. I just want to give you my testimony for an outstanding program! This program is outstanding! I had to build a new system after a power supply failure, and went to a dual core processor motherboard with SATA drives. I used my old ATA drive to migrate to the new system using an external fire-wire case, and managed to import all my email message and contacts, then pulled the fire-wire connector off, intending to finish the migration at a later date. After a great deal of frustration, I finally had to perform a clean Windows XP Pro install. When I went to import my data from the external hard drive, I discovered that the drive was corrupt! I tried another recovery program, and the results were poor, even after doing a quick format. The corruption caused that program to get halfway through the scan, and then closed with no error message, and no files! When I ran RecoverMyFiles, the results were phenomenal. It recovered at least 90% of my data, and actually preserved the file names and directories! I cannot praise you enough! Please feel free to edit this message and include it in your testimonies, if you chose! Well done! I have used this product on many friends computers with a "failed HDD" and it has always performed 100%. Thanks for the great customer service. Reasonably priced product that works! Our computer crashed a couple of weeks ago and we were told by Dell that we would probably lose all of our data as the operating system needed to be re-installed. We even took the system to Geek Squad and after 5 days they told us that there was no way to recover the data. We could see that there were 75GB of information in an unassigned partition of the hard drive but couldn't get to it. We figured we would have to re-write the drive so that we could start over. I learned about Wipe Drive from and article in PC Magazine. When I went to your Web site I saw that you also had Recover My Files. We figured we should give it a try, since we felt we had nothing to lose. I am happy to say that we ran it last night and this morning I woke up to find ALL of my files WITH file names still intact!! Thank you so much. I had 4 years worth of photos of my girls on this hard drive and I am so thankful that I didn't have to lose them. I have already recommended your product to others and am planning to buy Wipe Drive, Media Wiper and Secure Clean (you wouldn't believe all of the cookies that Recover My Files found!). Thank you so much for making a reasonably priced product that works and you can use at home. You have a fan for life!! Best regards, Gabriela Beecher. I just wanted to tell you that I find your product exceptionally effective. I had a major crash and hard-disk mess-up caused by a virus. In sorting the disk out I used your product to recover a huge percentage of my files! Even after several re-installs of the operating system, it somehow found files from months before the disaster. Much of what I do is creative work in music and business graphics, and so is not "re-creatable".RecoverMyFiles is easy and straightforward to use, gives just the options anyone would need for file recovery, and seems to dig files out of thin-air! (thin-cyberspace?!?) Congratuations and I hope you have continued success with RecoverMyFiles. "I just wanted to thank you for the great Recover My Files program and saving my life. Thank you for a well designed program that delivers as promised." "Recover My Files has already saved my bacon in several situations, and the most surprising was that it recovered some files that I had accidentally deleted on a digital voice recorder! Every time I've used it, I have been pleasantly surprised. That is not the case with most of the software that I've purchased and I'm not that easy to please." "I can't tell you how many other programs I've tried off of download.com over the past 24 hours. Almost ready to scream and give up all hope. I found Recover My Files on a Google search. "Awsome! Recover My Files recovered all my photos and video from a 250 gb drive that was in bad shape. It took 5 days to retrive the files but it kept chugging along and retrieved everything that was lost. Thanks. "I've never written down my opinion before but this worked too well not to. I formatted and partitioned the wrong hard drive. Recover My Files found everything and restored it. Zip files, mpegs, mps word and excel documents. It is well worth the price." "I needed a program to recover accidentally deleted JPEG files from a digital camera compact flash memory card. Recover My Files found them easily, in addition to numerous intentionally-deleted others dating to as many as 9 months ago. I easily selected the files I wanted to recover and it immediately saved them to the folder of my choosing. Perfect for my needs." "After a virus attack (that got through Norton) I took my PC to a pro (?) for repair. He backed up my hard drive (NTFS) to a FAT32 and completely buggered up all the data. He couldn't recover anything. I took the drive he'd used back home, plugged it in to the slave socket, and ran Recover My Files. Bingo; one pass and ALL the data files were back and usable. It doesn't pull back system files and the like, but that's not important. Simple, quick, and it works." Click the download button to begin the download. If possible, save then install the Recover My Files installation program on a drive other than the one on which your files were lost. Run Recover My Files, search your drive and preview the files found in the results screen.